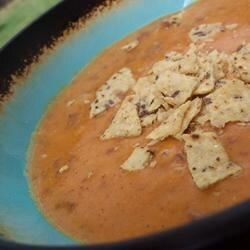 "A spicy, cheesy mixture of chili and cheese soup with the crunch of tortilla chips. This is a quick meal to fix that everyone loves!" Heat chili in a medium saucepan over medium heat. Empty soup and milk into a small saucepan and heat through, stirring, until smooth and creamy. Crush tortilla chips into bottom of individual serving bowls. When chili and soup are hot, scoop chili over chips and pour soup over chili. Sprinkle with chopped onion and serve. I didn't like this at all. Sorry to say we were a little disappointed with this recipe. It was a little too soupy and rather bland. I might try it again with more seasoning. Very good. I also added chopped tomato, and a dollup of sour cream. I made my own nacho cheese soup though. Too expensive and too salty to buy the canned. My family loved this one! I made my own chili and left the chips whole and everyone mopped it up! I think this would be good to serve for a party with lots of topping options. Very good and easy. Love the flavor! This recipe was awesome! It tastes just likes nachos!